We are deeply grateful for your outpouring of love and prayers for Heartline Founder, John McHoul, who is recovering from a recent heart procedure. Over the past few months, John began experiencing shortness of breath and chest pain. As his symptoms worsened, he sought the advice of Dr. John Carroll, a long-time friend who runs the organization Haitian Hearts. Dr. Carroll urged John to immediately seek medical treatment in the United States. John’s daughter, Morgan (who is also a nurse), agreed and began to make arrangements with a hospital in Florida. On Wednesday, June 28 John traveled to St. Petersburg, Florida for testing. Doctors discovered significant blockage in his heart and he was immediately admitted to the hospital. On Friday, June 30, John underwent surgery to have seven stents placed in his arteries. The procedure was extensive but successful. John’s wife, Beth, his children, and grandchildren have been by his side throughout this journey. 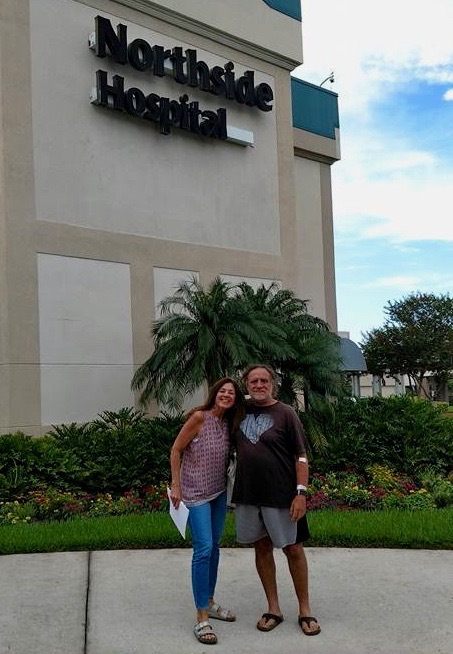 John was released from the hospital and is resting and recovering in Florida. He is enjoying reading and spending time with family. Beth returned to Haiti on July 13 to spend a week taking care of some things at home and helping with Vacation Bible School in Corail. John has a follow up appointment with the cardiologist on July 19. We don’t know exactly when John will return to Haiti, but for now we are joining him in trusting God in the wait. We are incredibly thankful for God’s miraculous protection over John, for everyone that urged him to seek medical attention, and for all of the doctors and nurses that have provided excellent care. Please continue to pray for John’s recovery and health and for perfect peace for John and Beth during this time of resting and waiting. We invite you to share an encouraging message with John and Beth in the comments below. Thanking God for your recovery, John. I am grateful you are in good hands. Love you both! So glad all worked out well and John is on the road to recovery! 15 years ago, standing in the “waiting” room at the US Embassy in Haiti with a fussy baby and a few hungry mosquitoes for what seemed to my pampered impatient American self be an eternity, John, you asked me this question…”Jessie, are you waiting well?” It was a simple question that would impact me profoundly in the years to follow. I have asked myself that question over the years countless times. “Jessie, are you waiting well?” Thank-you John for the gift that you gave to me so many years ago….that question that inspired me to come to the understanding that there is great spiritual insight and peace to be gained in the waiting. Lord bless you in the waiting dear friend. Praying for a speedy recovery for you, John. Excellent news! I also have always remembered a post by John about “waiting we’ll.” God bless! I am not religous at all, spiritual maybe on my good days….but i am a healthcare provider and i have seen faith (in a million different forms) work miracles for people who are ill or recovering. I am glad to see your faith is strong as i am confident it will see you through this storm in the best conditions possible. Aho and peace to you and your family. It is joy to know that these two are covered under the wings of our good Father. All things in life culminate into a waiting. Whether we wait for the promise of a blessing, the guidance of the Shepherd, or the vindication of our powerful Redeemer. I am forever grateful for the strength and faithfulness of the ‘body’ in the waiting and I am honored to be serve other members of the church in similar servitude. May we always be mindful of the members in all circumstances. So glad you caught this in time and are on the road to recovery….if you 2 would like to camp out here in SC we have nice guestroom and lots of river frontage. And decks facing the river…working on midwife /mission training center and healthiness eating vs meds in our own life…Love to have you guys ! Praying for everyone. Y’all are amazing! Love and miss you guys! Pray for you daily! Grateful for our time together this summer!